Stevia is an FDA-approved sweetener derived from the Stevia rebaudiana plant in South America. It’s a popular sweetener because, unlike many of the traditional sweeteners on the market, it doesn’t raise blood sugar levels and it doesn’t contain any calories. But that doesn’t mean there are no potential stevia side effects to consider. Many people use stevia for desserts and to sweeten beverages. It is a very convenient sweetener; it dissolves quickly to instantly sweeten any liquid or beverage. It is also not as expensive as other sweeteners on the market. Can Stevia Have Side Effects? So, does stevia have side effects? Although stevia glycosides—compounds formed by a simple sugar and another compound by a replacement of the sugar molecule—like rebaudioside A (Reb-A) are “generally regarded as safe” (GRAS) by the FDA, they are not necessarily free of potentially negative health impacts. In fact, raw stevia and crude extract for processed foods have yet to be approved. In short, there may be some stevia side effects. There is also concern surrounding the effects of stevia—along with other zero-calorie sweeteners—on gut bacteria. Research has shown that these products may harm helpful bacteria and encourage an unbalanced and unhealthy microbiome. Along the same vein, stevia use may lead to bloating, diarrhea, and other digestive problems in some people. 2. Stevia extracts: Some stevia brands that are made today extract the sweeter part of stevia and not as much from the bitter side of the stevia leaf. Although stevia extract may seem like a better option than other types of stevia, there is not enough research yet to show its effects. This type of stevia is 200 times sweeter than sugar. 3. 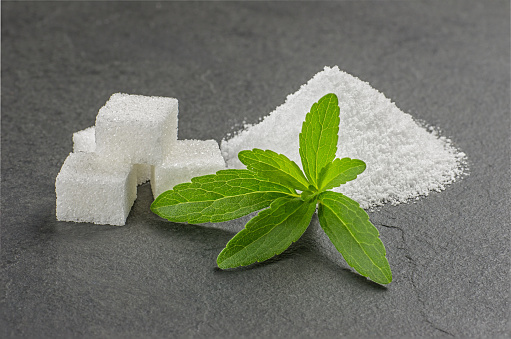 Processed/altered stevia and truvia: Truvia or rebaudioside products are 400 times sweeter than sugar—but this is the type of stevia that you should avoid. The problem with this type of stevia is how it’s processed; in fact, there are 42 steps to make this processed sweetener. Rebaudioside is extracted from the stevia leaf, and then chemical solvents are added, including acetonitrile (a carcinogen that is toxic to the liver). Also, several stevia products contain GMO ingredients made from GMO corn. On the ingredient packages, look out for maltodextrin. This is typically a genetically modified starch derived from corn. Also look out for dextrose—this is another name for glucose and is typically made from GMO corn. Which Is the Unsafe Form of Stevia? The most unsafe forms of stevia, which have not even achieved GRAS status from the FDA, are raw or less-refined varieties. These include leaves and crude extracts. Stevia may also cause harm when it’s mixed with other ingredients. Supplements and extracts may claim to feature safe, refined forms of stevia but instead feature other sweeteners that could lead to health risks. This can be avoided by purchasing products certified to contain at least 95% steviol glycoside and no other artificial sweeteners. Some side effects that can occur from consuming unprocessed and unapproved stevia products, or those mixed with other sweeteners, are more dangerous than others and may pose serious risks to your health. Your kidneys, blood pressure, and blood sugar levels appear to be most vulnerable to stevia’s negative effects. Kidney damage: Stevia is a diuretic, which means it speeds up the pace at which your body gets rid of liquid. Therefore, it pushes out water and electrolytes at an accelerated rate. It’s possible that the increased pressure on the kidney to filter water and produce urine could lead to damage. Low blood pressure: Stevia is a vasodilator, meaning it causes the blood vessels to widen and reduce overall blood pressure. This may not seem like a bad outcome; however, it may lead to problems over long periods and create risks for people taking medication to lower blood pressure. People who already have low blood pressure and who consume large amounts of stevia might see their blood pressure drop to a dangerous point. Speak to your doctor first about how much stevia you should consume if you have low blood pressure. Drug interactions: Stevia may have adverse effects when taken with certain drugs. There are reports that it can strengthen the impacts of lithium. Stevia can often act as a diuretic and prevent the body’s ability to rid itself of lithium. Some diabetes medications interact in a negative way with stevia, since both can lower the body’s blood sugar levels. If the blood sugar drops too low, it can become dangerous. Upset stomach: Stevia contains the compound stevioside, which is common for causing upset stomachs, bloating, or nausea. It may also decrease your appetite. The reactions are usually mild and should eventually disappear, but if the symptoms don’t go away, then you should contact your doctor. Allergic reactions: Stevia rarely causes an allergic reaction, but an allergic reaction is not uncommon for people who are already sensitive to daisies or ragweed. If you have developed an allergic reaction to stevia, you may experience dizziness, difficulty swallowing, wheezing, etc. If you experience any of these symptoms after you consume stevia, you should immediately stop consumption and seek medical treatment. Metabolism change: Tests on animal subjects have shown that ingesting large amounts of stevioside can interfere with the way the blood absorbs carbohydrates. This could limit your body’s ability to convert food into energy. Additional side effects: Other side effects that you might experience when consuming stevia are dizziness, numbness, and body aches. If you experience any of these symptoms, consult your doctor to ensure that you do not require any immediate medical attention or treatment. Because stevia can lower blood sugar, blood pressure, and disrupt the endocrine system, people undergoing treatment for these conditions may want to avoid it. Talk to your doctor before using it. Pregnancy and breastfeeding: Not a lot of research has been conducted to determine how stevia could affect women who are pregnant or breastfeeding; until more research is conducted, pregnant women and women who are breastfeeding are advised to avoid stevia. Recommended dosage: Although there is not enough information to state what the recommended dose for stevia is, your age and state of health could contribute to your dosage intake. Make sure to consult your pharmacist or doctor first. Make sure to contact your doctor or health care practitioner if you have any concerns or questions about consuming stevia. When it comes to zero-calorie sweeteners, much more research needs to take place before experts can make a definitive health claim. Studies have shown good and bad results, and so far, it looks like certain forms of stevia are safer than others. The effects may be dose-dependent, so keep servings small and infrequent, read labels, and pay attention to any mental or physical health issues that arise after using. The side effects of stevia, sweeteners (non-nutritive) still need further explanation. “Stevia Side Effects,” NewHealthGuide.org; http://www.newhealthguide.org/Stevia-Side-Effects.html, last accessed July 31, 2015. Geiger, S., “Is Stevia Safe?” EatingWell web site; http://www.eatingwell.com/nutrition_health/nutrition_news_information/is_stevia_safe, last accessed July 31, 2015.